Vernon Brown taught at the School of Architecture in Auckland, where his ideas about a vernacular architecture caught the imagination of some of his students. They formed a practice called Group Architects and set about designing and building houses that reflected the informality of the New Zealand lifestyle. This is the Second House, built in Auckland in 1950. Its low-pitched gable and entrance porch or verandah is reminiscent of a (Māori) whare. 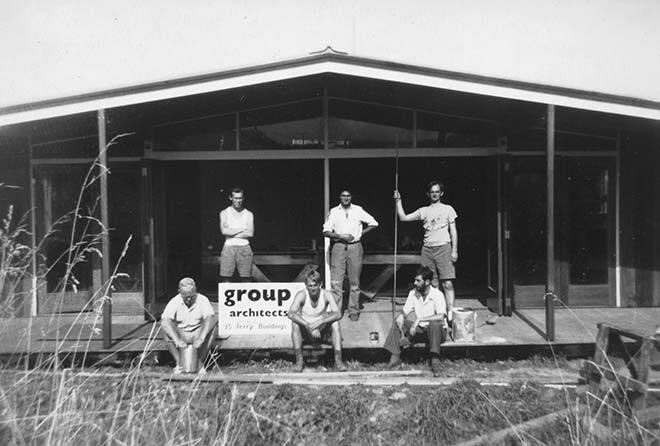 In front, seated, are architects Campbell Craig, Bret Penman and Bruce Rotherham, with Allan Wild, Ivan Juriss and Bill Wilson standing behind.